Pros: Graphite modelling toolset and ribbon interface; render-preview effects in the viewport; enhanced OBJ support; Containers; Material Explorer; mental mill. Cons: Some features already appeared in subscriber-only Creativity Extension for 3DS Max 2009; some known bugs and limitations; expensive. 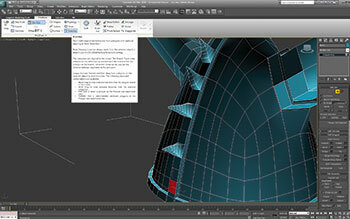 The newest version of Autodesk’s 3D suite contains some major interface changes. 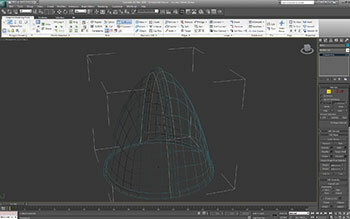 On opening 3DS Max 2010, you’ll immediately be aware of the new Graphite Modelling toolset. This allows you to directly select and manipulate polygon objects. Initially displayed as a single Graphite tab, when a suitable model – such as an editable polygon – is selected, the Ribbon updates to display a full range of polygon-editing tools, as well as freeform and selection tools. When each tool on the Ribbon is selected, a light green panel appears at the end, displaying the settings for the tool. Autodesk concedes that there is currently a bug in the system – the Graphite Tools and the Modify panel are not fully synchronized, so changes to some Modify panel settings do not update their equivalents in the Graphite user interface. We didn’t find this an insurmountable problem, though – using a button on the main toolbar, Menu bar, or the Graphite Modeling tools will update the user interface in any case. The Ribbon greatly improves workflow. We were able to select a single vertex, and then click on the options under Grow in the Modify tab to interactively expand the selection to cover a section of an object in a couple of moves. Loop and Ring modes are available – choosing two or more adjacent segments and clicking the relevant selection tool swiftly selects a parallel loop or ring of polygons. Another enhancement is the ability to set the selection to skip points, so it only selects alternate edges in a ring, for example. You can also add subsequent loops interactively using the rather nifty Swift Loop tool. Freeform tools are also available. All these tools are also available from the Command panel, but the Ribbon gives faster contextual access. 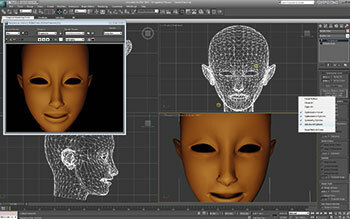 There are also other modelling enhancements, such as the ProOptimizer modifier. In common with other polygon-reduction tools – including the MultiRes modifier already in 3DS Max – this allows you to simplify models and thus reduce memory overheads when rendering. ProOptimizer has a more complex battery of settings, however, and the results were noticeably improved in comparison to the reduction offered by the older modifier.